When installing a screw conveyor, follow the correct installation method. This article will detail the correct installation of the screw conveyor parts of the method. (1) First, according to the location of the device line, the measured release of the screw conveyor slot “ten” word line, and then the center position, check the chassis bracket base bolt hole (or embedded bolt) position, to confirm the error to meet the installation After the request (including the horizontal size, vertical size, diagonal size, embedded bolt size and length), the next step. ② Install the machine slot. The screw conveyor slot is a segmented structure with a flange connected between segments. When installing the machine slot, the machine slot bracket can be temporarily fixed with the embedded bolt or embedded steel plate, the machine slot integrated, the overall leveling, after correction, with embedded bolts or embedded steel plate fixed. To ensure the straightness of the total length, the tank flange can be adjusted with the appropriate rubber pad or other material. After installation, adjacent flange flange surface should be connected to flat, close, the chassis surface misalignment deviation of not more than 1.4mm. ③Installation of the first, the end of the bearing, the middle bearing and spiral drum. First, the end bearing seat and the body for the separate structure, the first, the end bearing and the middle bearing seat to be temporary fixed, to be installed to find the spiral drum, find, and then fixed bearing. 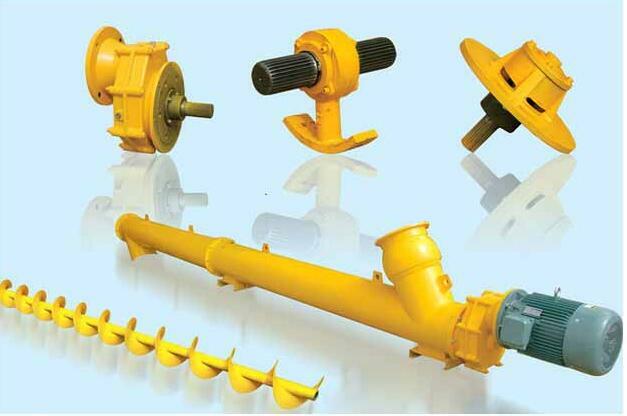 When the screw shaft is disconnected from the middle, it is necessary to ensure that the centerline of the screw shaft is exactly the same after the installation is completed. The screw bearing of the screw machine should be reliably fixed on the hanger of the case. After connecting with the adjacent screw, the screw rotation should be evenly installed. The installation can be used to adjust the gasket between the hanging bearing bearing and the casing lug. In addition, it is necessary to ensure that the two screw shaft parallelism error of not more than 0.5 / 1000, total length error of not more than 3mm. ④Installation of transmission rack and reducer, motor. First, to find a good spiral axis centerline as a benchmark, check the drive device frame of the base bolt layout position, height, and then install the drive rack, and horn with leveling, find, and finally fixed with the base bolt. In this process, we must pay attention to the height of the drive rack center should be slightly lower than the central axis of the screw shaft center height of 1 ~ 2mm, to the installation of the reducer to adjust the margin. After installation of the reducer output shaft and the screw shaft centerline must be strictly correct and consistent, the coupling of the gap and coaxial degree of deviation should meet the relevant requirements. ⑤ Equipment cleaning and oiling. Rolling bearings, reducer and other equipment for cleaning, after the equipment for oiling. This entry was posted in News and tagged concrete mix plant, concrete mixer by camelway. Bookmark the permalink. What is the Price of HZS90 Concrete Mixing Plant?